Peter Harte scored 1-3 as the Breffni challenged for half the contest with 14 men. Tyrone's Matthew Donnelly facing Padraig Faulkner. 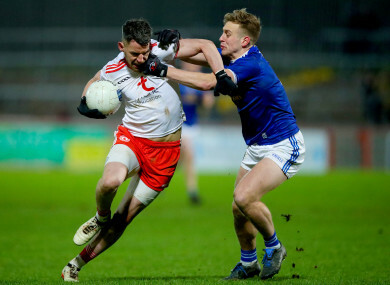 TYRONE SHOWED THAT the type of form they showed in early season defeats to Kerry and Mayo was not to be taken seriously as they polished off a poor Cavan challenge on Saturday evening. Any hope that Cavan might have had of drawing in the Tyrone half-time lead of 0-8 to 0-4 evaporated in the second minute of the second half when Killian Clarke’s heavy challenge on Kieran McGeary was adjudged to be worthy of a second yellow card. Cavan have a desperate record against Tyrone in any case and there were thoughts that they could have used the huge wind blowing down towards the Gortin Road end here once the changeover arrived, but the numerical advantage enjoyed by the home side, along with their growing assurance after a rocky league opening, meant Cavan’s true potential would not be realised. Midway through the second half, the end came for the Breffni men. Darren McCurry wasn’t on long but it was his little jink past the defensive cover that opened everything up for Peter Harte to drill low to the net for his second goal in seven days. A minute later and another kickout won, another substitute Kyle Coney arrowed over a curling effort that followed his pass to play in McCurry for the goal just prior. With Harte and Matthew Donnelly rampant in attack, Tyrone are developing something for later in the summer. They’ll be sound, while Cavan look like they are heading for another bounce back down into the second tier. Email “All-Ireland finalists Tyrone back on track as nine-point win worsens Cavan's woes”. Feedback on “All-Ireland finalists Tyrone back on track as nine-point win worsens Cavan's woes”.